The British Government undertook a series of atmospheric nuclear weapons tests at various sites in Australia and the South Pacific between 1952 and 1958. Associated with these tests was an experimental programme in which radioactivity was dispersed into the environment. This programme ended in 1963 although operations continued through to 1967. Additionally, UK personnel participated in a series of American tests based at Christmas Island in 1962. It is estimated that over 20,000 UK servicemen participated in at least one of these British and American tests. An ongoing concern within the nuclear test community has been whether veterans of these programmes could have received sufficient radiation exposure to cause genetic damage in them. This concern extends to whether they might also have passed on genetic alterations to their children, thereby potentially affecting their family’s health. Genetic damage can increase the risk of developing various diseases such as cancer, however of the studies carried out to date, no clear link between participation at nuclear test sites and increased mortality (death) or cancer occurrence relative to control populations, has been found (Muirhead et al. 2004, Darby et al. 1988b, Darby et al. 1993, Kendall et al. 2004). Reports of an increased incidence of miscarriage and genetic disorders in children of nuclear test veterans are largely anecdotal. This question of adverse health effects in the children of radiation-exposed parents remains outstanding. The consensus from international epidemiology (principally human population studies of Japanese A-bomb survivors) is that presently no conclusive evidence exists, yet this is tempered by some evidence from cellular and animal studies that support the presence of detrimental outcomes in offspring as a result of parental exposure to radiation. Accordingly further research is justified. This research seeks to address whether a heritable genetic legacy could exist in families due to historical participation in various military operations during the British nuclear testing programme in the 1950s and 60s. If service personnel were exposed to radiation at these nuclear test sites then cytogenetic markers consistent with such exposures may still be detectable within their peripheral blood cells. 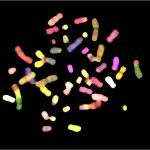 Additionally if the genome of their children is structurally or numerically altered then we should be able to identify these changes using cytogenetic and whole genome sequencing techniques. The amount and type of genetic change detected in the test veteran and descendent populations will be compared with genetic changes seen in veteran control family groups and statistically evaluated to detect if there are any statistically significant differences between the test and control groups. If differences are detected then this will lead to more directed research to explore further, if no differences are found then this will be useful and reassuring knowledge for the nuclear community. Permissions and ethical approvals were sought and gained from the required UK bodies. This is a necessary part of any research study involving human participants and in total took 17 month to complete. This study is well underway. The study permissions flowchart shows that participant recruitment began in January 2018 once all required UK permissions were obtained. Batches of invitation letters continue to be sent to potential participants GPs (see multistep process chart); our response rates are in-line with our estimates which were based on the veterans' age group and the need to consent a full family trio. 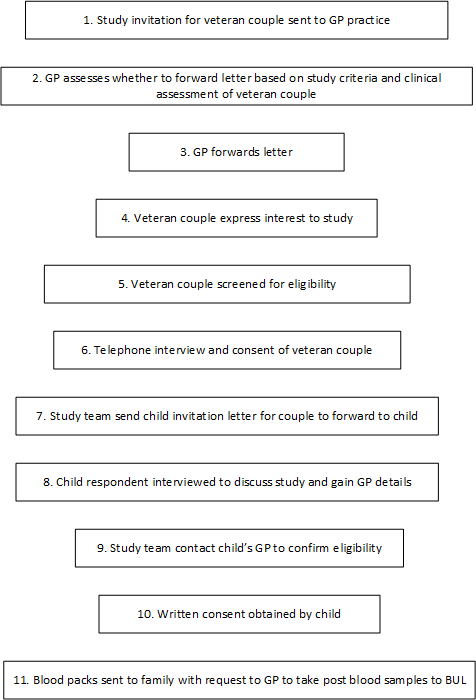 The average time taken from letter invitation until full trio consent is ~ 2 months and reflects the number of steps involved (steps 1-11) and, the work involved in screening and consenting as part of this approved recruitment process. Accordingly, recruitment numbers are constantly changing and we are progressively moving toward our target of 50 test veteran and 50 control veteran family trios. Full details of this study and the results generated will be reported through peer-review publication in scientific journals once completed. If differences between test and control populations are identified then further directed work will be developed to more fully explore the meaning of the findings, if no differences are observed, then this would serve to reassure the veteran community. Cells are being isolated from whole blood and analysed using a range of different cytogenetic techniques including fluorescence in situ hybridization (FISH) and Giemsa stain . (1) estimating radiation dose (dosimetry). (2) estimating type (or quality) of radiation exposure e.g. alpha-particle or gamma-ray exposure. 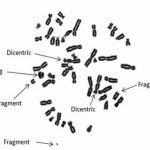 (3) determining the occurrence of any genomic instability. We are using these research cytogenetic tests to examine for any differences between the test and control populations. 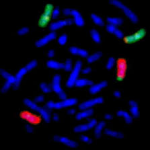 Two-colour FISH reveals a stable reciprocal translocation between a red and green chromosome. All other chromosomes are stained blue. Giemsa stained metaphase cell showing unstable, potentially newly arising, abnormalities such as dicentrics and fragments indicative of genomic instability. DNA is being extracted from whole blood samples and processed by a technqiue called whole genome sequencing to estimate the relative proportions of mutated DNA detected in test and control populations. This is being analysed using a range of bioinformatics tools to identify and characterise the spectra (type) of any newly arising mutations which are found in the child’s DNA sequence. This work will allow us to estimate the effects of any paternal (from the father) exposure on mutations induced in the human germline.